Paul Thomas Anderson has cited John Huston's post-war documentary, LET THERE BE LIGHT, as a key influence on the themes, style and dialogue of his film, THE MASTER. With that in mind, I hunted downloaded a copy of the restored film from the wonderful people at the US National Film Registry, to see if it would shed any light on that elusive, troubling work. 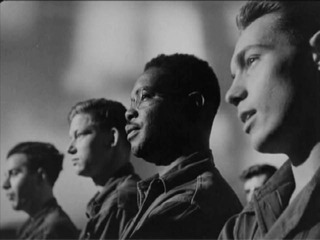 The movie is an hour-long black and white documentary produced by the US Army Pictorial Services, in 1946, designed to show their troops the "after-care" that the traumatised might receive before re-entering civilian life. The movie was ground-breaking in three respects. First, it was the first film to show the impact of post-traumatic stress disorder, in an era when that was very imperfectly understood. Second, it the filming took place in a segregated hospital on Long Island, in an era when the US Army was still segregated. Thirdly, despite being shot by the director who is most closely associated with the rugged, mythic American Man, it shows a desperately affecting sensitivity to, and respect for, the men, in an era when they might have been written off as flaky or cry-babies, or just plain mad. It was clearly seen as too ground-breaking. Suppressed by the Army until 1980, as being too honest a portrayal of the damage war can do to men, and therefore "bad for recruitment". LET THERE BE LIGHT takes the form of group and single interviews with servicemen struggling, like Freddie Quell, with PTSD, as well as fly-on-the-wall footage of classes they attend and treatment they receive. The movie imposes a redemptive arc on the men, from admission, through drug therapy, hypnosis and eventually to being released rehabilitated. But viewers know that all is not well. The men are ashamed of their problems, unable to articulate why they're so hurt, and even as we see them sent back to "real life" we know they are ill-equipped to cope. It's a deeply affecting film. None of the men are as physically broken as Freddie Quell, presumably because the US Army would not have allowed them on film. In fact, what strikes us is how articulate and composed they are - how respectful and trusting in the institution that has maimed them - and indeed how naive they are about how civilian society will treat them. One particular soldier, an African-American man, speaks calmly and movingly about "breaking out" of the narrow social circle in which he was constrained before the war. Another soldier has complete belief that any potential employer, by virtue of his having attained the position of being an employer, will be intelligent and sensitive enough to understand his psychological problems. All of which speaks to a time when people were more polite and more respectful or organised and established power structures. The influence on THE MASTER is clear. Freddie Quell is shown in early scenes that echo the interviews and treatment in LET THERE BE LIGHT. He emerges a deeply broken man unable to diagnose let alone cope with his PTSD. This was as I had expected. What I found more fascinating was that some of the treatment Freddie receives in The Cause also echoes the US Army's methods in the documentary: hypnotherapy, positive reinforcement, and the talking cure. Seeing both films together makes Quell's attraction to The Cause somehow more understandable. He has been conditioned by his Army treatment to respond to such direct orders and paternalistic care. He has merely substituted Lancaster Dodd for his Army doctor. It's fascinating and heart-breaking stuff. LET THERE BE LIGHT is available in a cleaned-up but still woefully scratchy 58 minute version thanks to the fact that it won a place in the Library of Congress' US National Film Board Registry. (Link above). It can also be found on YouTube. It will also be included on THE MASTER blu-ray and DVD with 20 minutes of previously cut footage. link appears to be broken B.